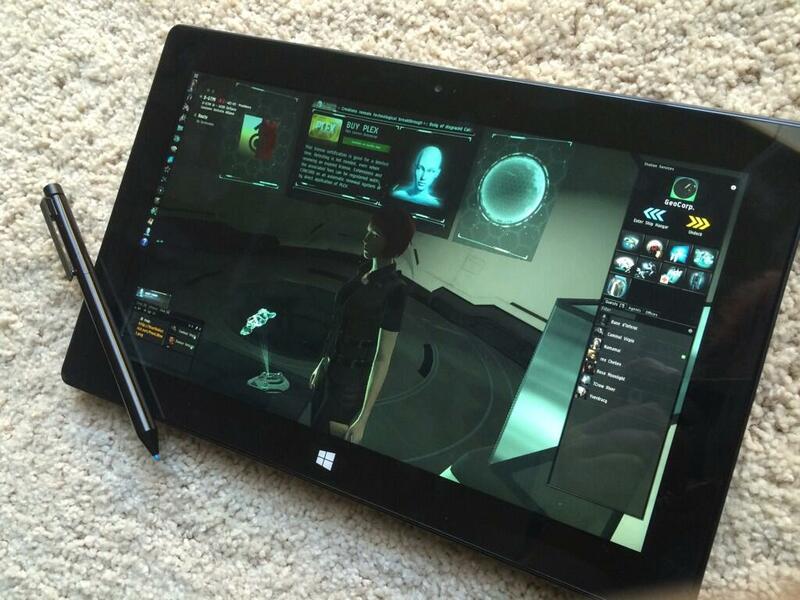 That's EVE Online running on a Surface 2, courtesy of Rote Kapelle member Namamai. He claims that he gets 35-40fps while undocked. Hee! It's not quite the hand-held version of EVE that was teased a few Fanfests ago, but pretty close! As soon as I saw the Radial Menus that CCP have been implementing throughout the client, I wondered whether they were a stepping stone to a more touch-friendly interface? I was able to run EVE on a crappy 2 year old Acer aspire one netbook (not my main gaminig rig thankfully)... this guy is probably getting better performance! Do bare in mind that touch controls don't work for eve (you have to double click everything, including double right click). I've not tried with a active stylus (like the one pictured), but I can believe that might fix the issue. I've been running EVE on the original Surface for a while now, it's useable but both double-clicking and right-click menus are not touch friendly. I run Eve on my Dell Venue 8 Pro and it works all right, you can trade, chat, fly around in space, but I've not tried using it in combat. You do need a mouse though, because the touchscreen mouse movement is delayed inside Eve for some reason. I was just thinking of trying it out on my Lenovo Thinkpad Tablet 2.... The temptation grows. It's an American thing I believe. Do you care to explain how Bible belt morals straddle Europe and the rest of the world. I feel someone should apologise for their prude behaviour.